Fetchnotes is a promising, lightweight note-taking app for list makers and idea-havers which looks deceptively simple. But that simplicity is actually one of Fetchnotes’ key selling points. It’s meant to be fast and easy to use. And although there are a ton of apps for taking notes, from robust offerings like Evernote to more limited mobile apps like the Notes app that ships on the iPhone, Fetchnotes has an interesting idea about how note-taking apps should work – that is, they should work more like our own minds do. Thoughts come to us unbidden and we jot them down. That’s it. Explains Fetchnotes co-founder Alex Schiff, “task management or to-do apps force you into this rigid structure about how you’re supposed to get things done or that you’re only supposed to use this for to-do’s, whereas what we’ve done is we’ve created a very flexible application that allows you to write your own use cases,” he says. What that means in terms of Fetchnotes’ user interface, is a fast-loading app, a plus button to add a note, a blank page to type in, and a hashtag to categorize it. Fetchnotes basically throws the idea of prioritization out the window with its apps, which work on iPhone, Android, Mac, PC and even Linux. Instead of having important items at the top or color-coded, for example, the items in your lists are hashtagged. It’s an idea that’s borrowed from Twitter, so it will make a lot of sense to those of us already working in the digital space. So, for instance, a note reading @joesmith fix the screen on the back door #home, could send a note to your spouse’s list on their phone. Nifty! Another innovative feature is the ability to add notes via text messaging (after first registering your phone number with the service), which opens up the app for use by non-smartphone users who still need a way to jot down their passing thoughts. You’ll also be able to phone into the service to retrieve notes, saying “fetch” then the tag, like “fetch #todo,” which will again be helpful for those whose phones can’t run apps. The whole service is built on top of one API, so notes are immediately synced between your different client apps, whether desktop or mobile. For now, the mobile apps are smartphone-only, and don’t support Android tablets or the iPad, but that, too, will change in the future. Also rolling out in later versions will be the obvious integrations with other third-party services to sync notes to apps like Evernote or to place appointments on your Google Calendar. The idea is that the Fetchnotes interface, because of its simplicity, would be the preferred first stop for writing down short notes, which could then be funneled to the other services you use. Schiff co-founded Fetchnotes with Chase Lee, both current University of Michigan students. They are bootstrapping the startup from their own pockets. 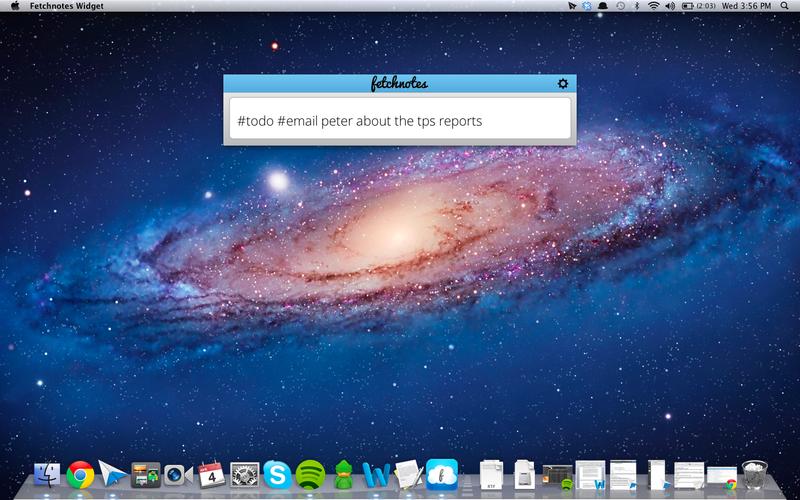 Fetchnotes had previously been in private beta, but is launching publicly today on all platforms. You can download the app from the service’s homepage here.